Join us for an exclusive networking reception with in-house counsel before the Annual Gala from 4:30 p.m. to 6 p.m. Purchase this separately from your main gala registration. Gala dinner not included with this registration alone. NOTE: This reception is FREE to in-house counsel. There is no need to register separately. We will identify you by your employer listing and you may attend. Note: 2017-2018 MNAPABA membership included, select the appropriate box during this online Gala registration process. For In-house Counsel who want to attend the Pre-Gala Reception, but will not attend the dinner program. Thank you, Bob and friends. Please select your registration type by law practice. The Pre-Gala Networking Reception with In-House Counsel is an exclusive event that you may attend for $125. Register separately and in addition to your gala registration. Sponsors should have received a registration code which is good for all your attendees' registrations (Gala Dinner and Pre-Gala Reception). If you have questions, contact Alex Dyste (dysteale@gmail.com). 2017-2018 MNAPABA Membership included. ONLINE REGISTRATION IS NOW CLOSED. WALK-IN REGISTRATION SHOULD BE AVAILABLE FOR A FEW REMAINING GALA DINNER SEATS. PLEASE BRING PAYMENT TO THE GALA. 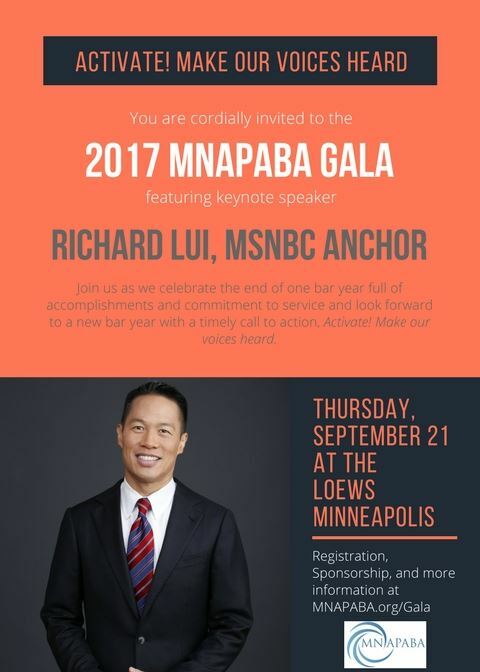 Join the Minnesota Asian Pacific American Bar Association for its 2017 Annual Gala on Thursday, September 21, 2017. This year, we explore the purpose of MNAPABA with a timely call to action, "Activate! Make Our Voices Heard." Our Keynote speaker for the evening is Richard Lui, news anchor for MSNBC—an expert communicator on API issues himself and one of only a handful of API men in an anchor role on national television news. Please consider becoming a Gala sponsor and supporting our 2017-2018 programming! If you have any questions about this year's gala, please contact MNAPABA President Ben Kwan (ben@hallerkwan.com; 612-206-3761).